In 2017, United Way of Southeast Louisiana shed light on the often overlooked households in our communities who work hard but struggle to make ends meet, households we call ALICE — Asset Limited, Income Constrained, Employed. And now, in 2019, we are reviewing our progress and the state of financial hardship across our seven-parish service area, which includes Jefferson, Orleans, Plaquemines, St. Bernard, St. Tammany, Tangipahoa, and Washington parishes. This updated ALICE Report upends the conventional view of financial stability in Southeast Louisiana, according to unemployment numbers and jobs reports. The reality is, nearly one in two households in our region is unable to afford basic expenses, including housing, child care, food, transportation, health care, cell phone access, and taxes. Learn more about the United Way ALICE Project at UnitedWayALICE.org. Why are There So Many ALICE Households in Louisiana? 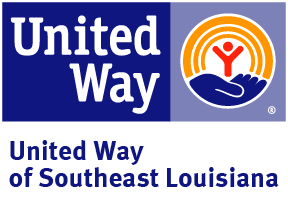 What is United Way of Southeast Louisiana Doing to Help? 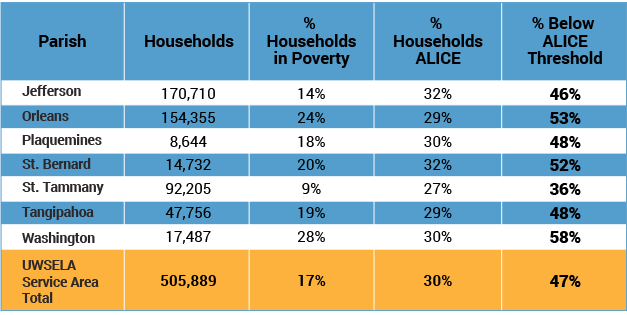 The ALICE Report sheds light on the staggering number of struggling households of every age, race, ethnicity, and gender who are overlooked by traditional poverty calculations, households we call ALICE — Asset Limited, Income Constrained, Employed. ALICE is your neighbor, family member, and friend; your waitress, office manager, cashier, and child care worker. ALICE works hard in low-wage jobs that keep our communities running, but don’t pay enough to make ends meet. 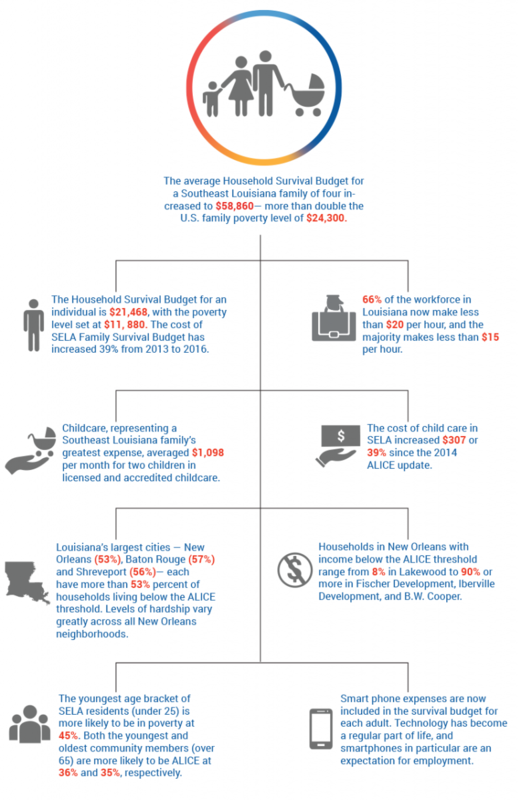 In 2016, one in two households in Southeast Louisiana struggled to get by, unable to afford the basic necessities: health care, housing, food, child care, transportation, taxes, and a smartphone. Living paycheck to paycheck with little to no savings, ALICE families are one major accident, medical bill, or harsh storm away from poverty. When ALICE households lack adequate income, reducing expenses is a matter of survival. These short-term tradeoffs, like a skipped doctor’s visit or delayed car repair, have long-term consequences for us all. Learn more about the consequences of ALICE here. While the Federal Poverty Level reports that only 17 percent of Louisiana households face financial hardship, an additional 30 percent qualify as ALICE. More than 237,000 households – or 47 percent of Southeast Louisiana’s population live below the ALICE threshold. ALICE households earn above the poverty level but below the Household Survival Budget. Households living under the ALICE threshold include both ALICE and households in poverty. The 2016 data increases the number of Southeast Louisiana ALICE households by six percentage points while the percentage in poverty decreased from 19 percent. This percentage represents 31,450 more ALICE households struggling to make ends meet throughout the region. Since 2010, SELA households below the ALICE threshold has increased 12%. Despite overall improvement in the economy, ALICE continues to face challenges from low wages, reduced work hours, depleted savings, and increasing costs. The basic cost of living outpaced wages. The Household Survival Budget identifies the minimum cost for each of the seven basic household items needed to live and work in today's economy: housing, child care, food, transportation, technology, taxes, and health care. The cost of these expenses increased steadily in every parish in Louisiana since 2010. Changes in the workforce – Low-wage jobs dominate the local economy. Single adults now need an annual salary of over $21,000, while a family of four needs an annual salary of over $58,000 - just to afford the basics. Gaps in wages are growing wider and vary depending on employer size and location as well as the gender, education, and race/ethnicity of workers. An increase in contract and on-demand jobs is leading to less financial stability and health care coverage. Child care affordability and accessibility remains a challenge. When parents cannot work due to limited or inaccessible child care, consequences are twofold - the child may not gain early-learning skills necessary for success in kindergarten and beyond, and the parent has to forgo work, limiting future earning potential. Fewer families have savings and assets. Ownership of assets can contribute to stability of households. Yet few families in Southeast Louisiana own assets, such as a savings account, 401(k), or rental income, that are readily available to cover emergencies. The bottom line is, ALICE households are forced to make difficult choices often skipping preventative health care, accredited child care, quality food, or car insurance. These "savings" threaten their health, safety, and future, and the costs are high for both ALICE and the wider community. 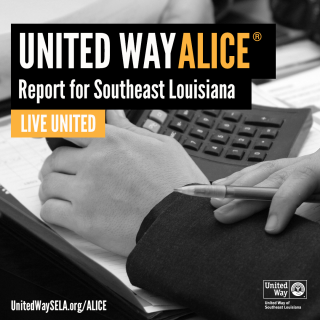 The United Way ALICE Report update for Louisiana advances information by two years, updating data sources from the years 2014 to 2016. Learn more about the United Way ALICE Report’s methodology here. Access an in-depth and interactive analysis of statewide and parish-specific data through the United Way ALICE Project. Neighborhood data is available for Orleans Parish only. Explore the maps and content to learn more about ALICE in your community. Hover over the map to reveal topline household data. By selecting one or multiple parishes on the main state map, you can aggregate the data in different ways. While our goal is to eradicate poverty in our region, much of our community impact work is geared toward supporting ALICE families, including responding after natural disasters and investing in child care, education, workforce development, and other supports aimed at putting ALICE families on pathways to prosperity. 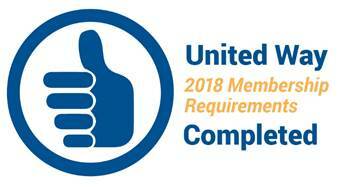 United Way continues to advocate for sound public policy to draw down millions of dollars back into our communities and the pockets of those struggling to get by financially. These policy advancements address the high cost of child care in our region, promote re-entry efforts that help ALICE households move up the ladder, and ensure that all families are safe and can afford necessary health care in times of great need. We are engaging communities across our region in conversations about ALICE and how we can generate more opportunities for ALICE families. And we continue to provide leadership and support to drive systemic change in the areas of education, financial security, and health so that all ALICE households can succeed. 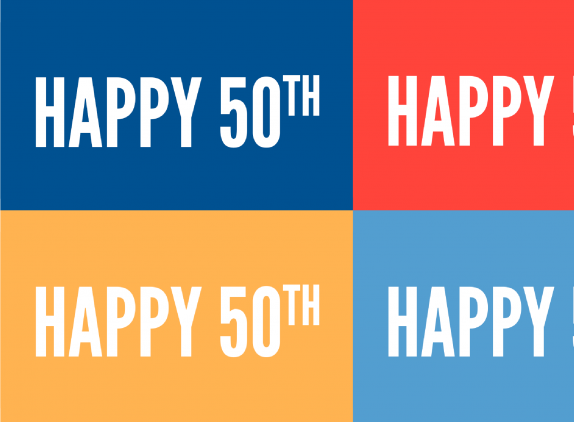 To do so, we believe the best path forward is through United Way’s Blueprint for Prosperity – which calls for people working together to affect change. We’re bringing together community partners, business leaders, and elected officials to tackle the most pressing challenges ALICE faces, and developing lasting solutions to build a better, brighter Southeast Louisiana for us all. 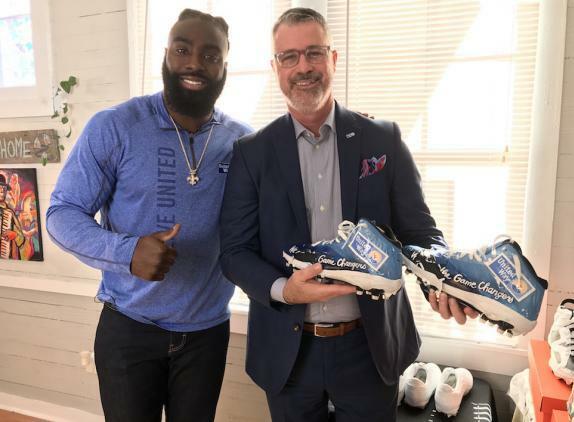 Learn more about United Way of Southeast Louisiana’s advancements in 2018 here.